In between throwing out perfume bottles shaped like fists of varying thematic absurdities and milk bottles, Diesel comes out with Loverdose, an unfortunately named perfume for women in a somewhat tasteful flacon. In Bottle: Wow, the anise is out in this one. It’s just about all I can smell at first until I realize the sweetness is masking some inane florals. Not really encouraging, sadly. Applied: First thing I smell is anise and anise is just about all I can get out of Loverdose until it decides that it’s good and ready to let me in on something else. But what Loverdose does to its anise is unfortunate. If well blended, anise can lend a sophisticated sweetness to a fragrance. I associate anise with comfort and sometimes exoticism. In Loverdose, anise is like a sledgehammer and my nose is in its way. The midstage is marked with a sweet floral that reminds me too much of the failed perfume experiment I conducted when I was a child by mixing two of my mother’s fragrances together along with a few sprays of floral air freshener. The dry down isn’t much better, as the wood, amber and vanilla do nothing to temper the sweetness that’s been with this fragrance since first spray. Overall, Loverdose is a bit of a mess. Extra: Loverdose was released in 2011 by Diesel. You might know Deisel from their popular denims. Design: I wouldn’t say Loverdose is at the top of the design game here. But compared to the other designs from Diesel’s other fragrances, this one is a few cuts above the rest. It is not shaped like a fist. It is not shaped like a milk bottle. And it does not remind me that I have to spray for termites soon (I don’t know, I’m just strange). So what if it’s a big purple heart and I’ve made it well known what I thought of those? Loverdose is at least more aesthetically pleasing even if it is still somewhat ridiculous. It has a nice weight to it, it’s easy to hold and spray, and it’s made of good enough material. Good on ya, Diesel. Notes: Mandarin, star anise, licorice, jasmine, gardenia], amber, vanilla, woods. I guess I have to touch on the name of this stuff. I thought it was clever for about a minute, then had to groan because the name of this stuff just hits too close to pun territory. Sorry, Diesel, this one doesn’t appeal to me. 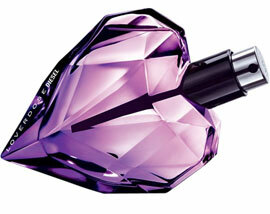 Reviewed in This Post: Loverdose, 2011, Eau de Parfum. This entry was posted in diesel, oriental and tagged amber, gardenia, jasmine, licorice, mandarin, star anise, vanilla, woods. Bookmark the permalink.